Steel Cut Oats recipe for Instant Pot Gingerbread oats with and eggnog float is perfect choice for wintery mornings. Creamy, with a chewy bite, brimming with holiday flavors. I’m feeling a bit festive with the holidays rolling on in and have put my Instant Pot to work with dazzling results once again. 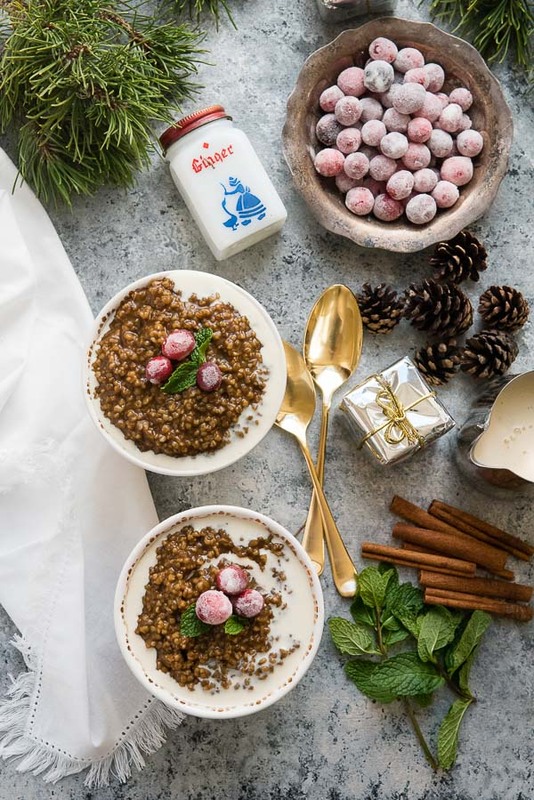 A steel cut oats recipe is causing great excitement at the breakfast table: Instant Pot Gingerbread Steel Cut Oats with an eggnog float on top! This steel cut oats recips makes a warming, delicious start to the day. It’s both easy and fast to prepare, leaving only one pot to clean up. 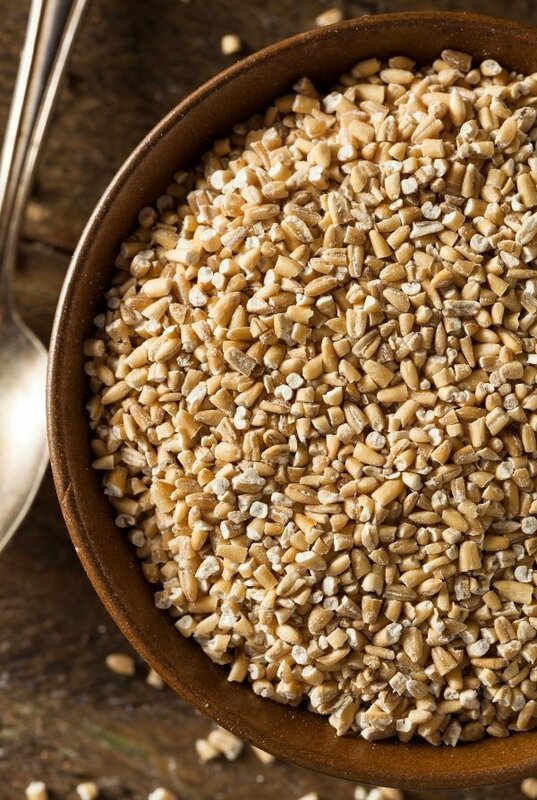 Steel cut oats are processed so the whole oat groat (the oat kernel without the husk) is cut into several pieces; leaving something that looks very similar to broken rice kernels. They take longer to cook than the flat, soft rolled oats of traditional oatmeal fame. Steel cut oats are often called Scottish or Irish Oats and have a wonderful chewy texture. If you have had steel cut oats, you’ll know they are nothing like oatmeal. They feel to have more substance thanks to their texture when prepared. This steel cut oats recipe is no exception. Full of those sweet, familiar winter flavors, it comes out of the Instant Pot soft and ready to be eaten. 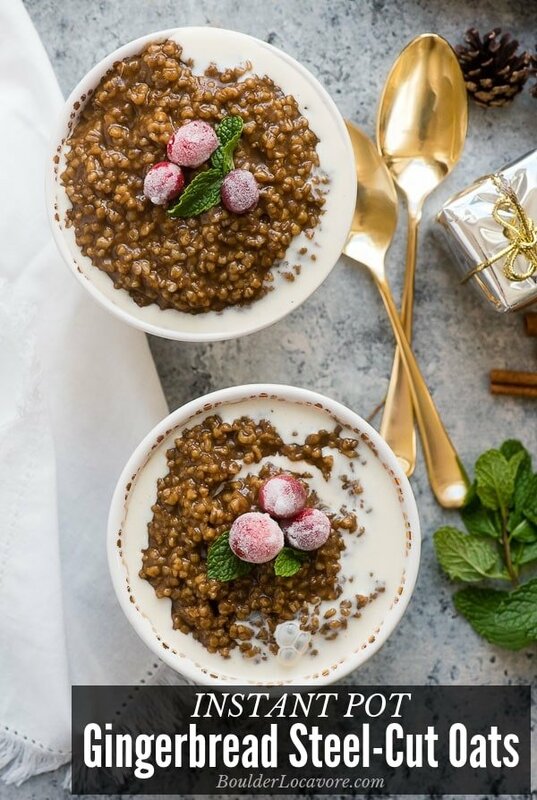 What are the Ingredients in this Instant Pot Gingerbread Steel Cut Oats recipe? Cooking steel cut oats in the Instant Pot is a great choice! Why? 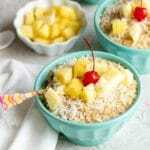 How Long Does it Take to make this Instant Pot Steel Cut Oats recipe? It takes about 30 minutes for the Instant Pot Gingerbread Steel Cut Oats recipe to be done; which includes the time for the Instant Pot to come to pressure. I love drizzling the prepared eggnog on top for a favorite holiday flavor combo!! It was a happy, happy day for me when steel-cut oats became available in a gluten-free version. Though oats do not have gluten in them, they are subject to cross-contamination in processing (and can produce cross-reactivity in some gluten-intolerant people). So those on a medical gluten-free dietary program, like me, must eat only gluten-free oats. After I became gluten-free over a decade ago it took some time for regular rolled oats to become available for hot cereal. Steel cut oats are even more recent, and a thrilling option for me. If you don’t have an Instant Pot, I suggest making Pear-Ginger Oatmeal with Candied Maple Pecans! 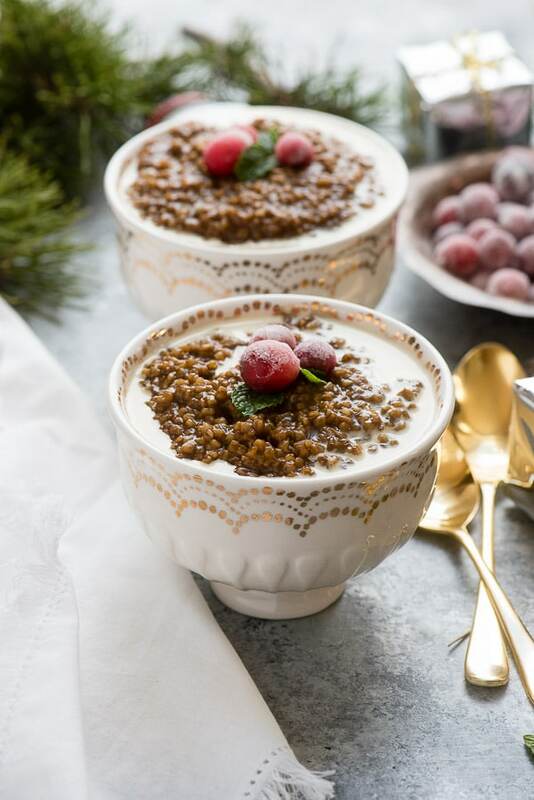 If you’ve made this Instant Pot Gingerbread Steel Cut Oats recipe please RATE THE RECIPE below! SUBSCRIBE and FOLLOW ME on FACEBOOK , TWITTER , INSTAGRAM and PINTEREST ! Spice up your regular oatmeal with gingerbread-flavored steel cut oats prepared in the Instant Pot. NOTE: Recipe developed in a 6-quart Instant Pot. Turn Instant Pot to Saute and add the butter to the insert. Allow the butter to melt in the insert then add all of the spices, brown sugar and molasses; stir to completely combine. Add the steel-cut oats and water and stir to combine. Lock the lid in place, ensuring the vent is sealed. Select the Porridge setting, High Pressure and 12 minutes. When the cooking is completely allow 10 minutes of natural release. Follow with a manual relase of the remaining pressue. Remove the lid and stir the oats (there will be a layer of liquid on the top) and allow to sit on the Warm seting for 1-2 minutes before serving. 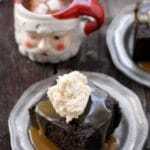 Top with eggnog and any other favorite toppings. The cooking time is 12 minutes with a 10 minute natural release. The time for the Instant Pot to come to pressure may vary but 10 minutes would be an estimated time. This recipe prepared in a 6-quart Instant Pot. I’d like to make this for my parents when they visit for the holidays. My mom isn’t great about sugar. Just double checking to see if the gingerbread oats are sweet? Thanks for letting me know and thanks for the yummy looking recipe. Hi Elizabeth. 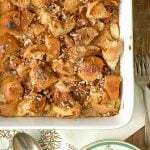 As you see in the recipe there is brown sugar and molasses but really not much for the volume of water (3 tablespoons and 1 tablespoon). In my opinion, the oats have just the right amount of sweetness to blend well with the spices but not to overtake the entire dish with dense sweetness. The eggnog on top is sweet too. Perhaps you could make a batch and if your mother feels it’s sweeter than she’d prefer, add some milk on top to mix in which will dilute the sweetness a bit. I hope that helps! Hi Diane. This recipe was developed in a 6-quart Instant Pot DUO. I think your second question was asking if it was made in a 6-quart Instant Pot, whether it can be made in an 8-quart too? I did some quick research and did not find clear guidelines about making a 6-quart recipe in an 8-quart Instant Pot. 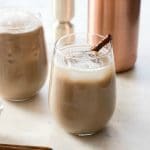 I did compare the required liquid and this recipe has double the minimum for an 8-quart so you are good there. Intuitively I’d think it might take a bit longer to come to pressure and might need a bit less cooking time but I’d suggest researching that further. If it were me, I’d make the recipe as is. If it’s not perfect it should be close and you’ll know what you need to adjust the next time (e.g a bit less cooking time, etc). Will you let me know how it goes? I’ll keep researching the conversion for a different size too.